In order to determine the dimension of a separation column, hydrodynamic and mass transfer models are necessary to evaluate the pressure drop and the mass transfer unit height. The present work evaluates the dependency of those parameters with respect to the diameter of the column by means of an absorption column. The process within the absorption column is carried out using three different structured-packings (ININ, Sulzer BX, and Mellapak) and one hazardous packing (Raschig rings), in order to recover SO2. Structured packing has been achieving wider acceptance due to its greater efficiency in the separation process. The results show how the ININ packing does the best work because it has the lowest height of the global mass transfer unit and the Mellapak packing has the largest capacity because it manages the largest flows. ISNAD Chávez, Rosa , Guadarrama, Javier , Hernández-Guerrero, Abel . "Effect of the Structured Packing on Column Diameter, Pressure Drop and Height in a Mass Transfer Unit". 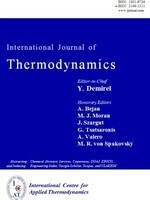 International Journal of Thermodynamics 7 / 3 (September 2004): 141-148.